One of the greatest challenges when considering an Internet of Things framework for an existing or new project is getting the system running within a tight deadline. A greater challenge can be expected in choosing the interface between one’s devices and the network. One could of course, create a bespoke interface solution, or use an existing product. The latter is ideal for proof-of-concepts, quick jobs or just when one needs to get a minimum viable product through the door. Twine is one example of an existing solution that can be used to get a basic system up and running quickly. Although originally an idea that was brought to fruition using crowdfunding via Kickstarter, Twine has now become one of many viable choices in the IoT marketplace. 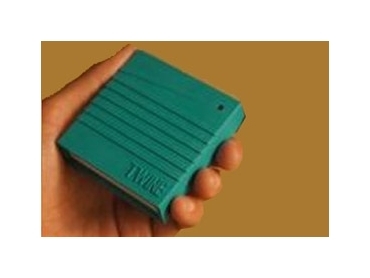 Twine consists of a hardware and software component. Measuring approximately 70×71×20mm, Twine devices can fit in the palm of the hand. The elastomer coating ensures the devices are quite robust, but not water-resistant or waterproof. Providing the link between the cloud-based software and a variety of hardware options, each device features temperature, vibration and orientation sensors, and a port for external sensors. It connects via an 802.11b wireless network and is powered via a micro USB socket or 2 AAA cells. One can also acquire a range of external sensors covering moisture, magnetic switches and also a breakout board to connect their hardware. Any device that outputs an analogue or digital signal can be connected with a 0~3.3 V range. An Arduino shield is available for connection to the ubiquitous line of hardware. These two options offer the ability to quickly connect one’s own sensor or interface via an Arduino-compatible board to other hardware over the cloud system. The ease of interfacing with the sensor port or Arduino interface reduces the development costs of additional hardware. One can interact with the Twine hardware using their proprietary cloud-based system or via HTTP to one’s own applications. In the cloud-based method, one can create a series of rules that monitors incoming sensor data and then make decisions based on the results. For instance, one can configure email alerts notifying temperature changes or SMS text messages when a device has been physically moved. Messages can also be received via Twitter and text-to-voice call. The process of creating applications for Twine doesn’t require any coding at all, so demonstrations of the system can be created and modified by employees and management. An online drag-and-drop interface with simple condition parameters is used to generate actions based on the status of the connected sensors. Twine can also be made to directly interact with one’s own infrastructure using HTTP GET and POST requests – a preferable option for those looking to keep their data within internal systems. Though not the most complex or customisable system currently on the market, Twine can be a valid option if it meets the requirement. The user can get a basic system operating in a few hours, and integrate other hardware in no time. LX Group can guide companies interested in moving forward with Twine or other platforms, through the entire process from simple installations for demonstration purposes to a complete system with customised external sensors and programming support.